A group of old Uni mates are trying to plan a lad’s holiday. That night one of the friends is brutally attacked and killed. The story follows on 6 months after his death and his mates have decided to honour his memory by going on a hiking holiday in Sweden as it was his choice to go there. They build a fitting memorial for their lost mate, a few words are said but there is an atmosphere between the friends. Luke (Rafe Spall) is harbouring a lot of guilt as he was a witness to the attack and is convinced the others feel he should have done more to help, arguments ensue and to try and diffuse the situation Hutch (Robert James-Collier) thinks its best to get to the nearest pub ASAP. When the weather turns they make a unanimous decision to take a shortcut through the forest. It is not long before weird things start to happen, strange runes start appearing and they find a mutilated Elk corpse hoisted into a tree, when they seek shelter in a cabin containing a frightening Beast-God effigy that causes them all to have horrendous nightmares they all start fearing for their lives. Whatever it is responsible for all this is not far away and stalking them, slowly picking them off one at a time. A very effective and haunting movie combining jump scares and really quite terrifying visuals at times, it keeps you on edge with a very urgent sense of dread. 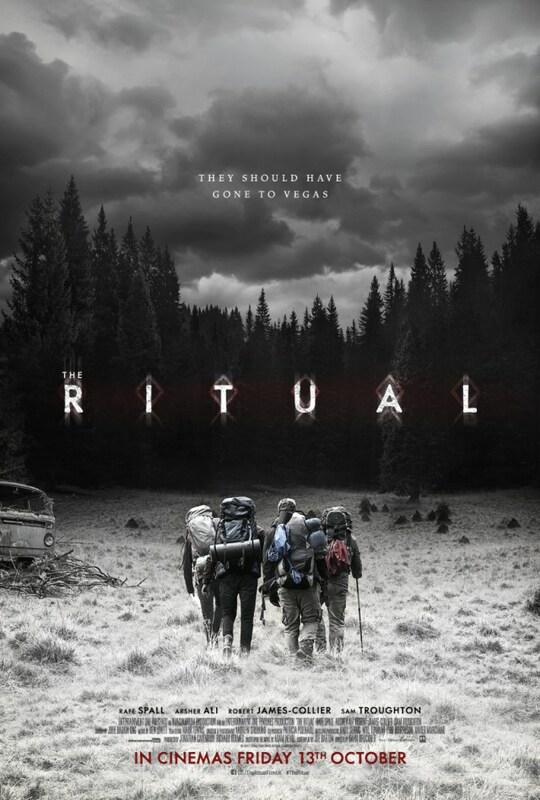 I know that a lot of comparisons will be drawn between this and The Blair Witch Project as the setting and feel is very similar but The Ritual goes so much further with the scares and the creature then BWP ever did. The beast itself is the stuff of nightmares and really well created. The cast and acting is fantastic although, script wise, it is in danger of getting bogged down with quite a few arguments but the suspense is ever present and the overall doomish undercurrent keeps your attention, the setting is truly beautiful and terrifying in equal measures. The soundtrack really adds to the atmosphere there is so much to enjoy about this movie. Directed by David Bruckner who, as a writer, contributed to V/H/S and SOUTHBOUND has created a great chilling movie, ok so this idea has been done a few times before but this has its differences and is incredibly well done in everyway. It takes a more hands on approach towards the end and its final moments will leave you emotionally drained and in need of a stiff drink to calm the nerves.